Claude Harrington, a first-year Stanford Law School student, is the 2017 Michigan Auto Law Student Diversity Scholarship winner. On behalf of all attorneys at Michigan Auto Law, I’d like to offer congratulations to Claude Harrington, the winner of the Michigan Auto Law 2017 Law Student Diversity Scholarship! Claude is a first-year law student at Stanford Law School in California. He graduated with honors from Washington University in St. Louis, where he double majored in political science and leadership and strategic management. In his essay, which you may read here, Claude explained to us that being an African-American in St. Louis meant feeling like he was expected to join protests in order to effectuate social justice change. He was in a community that had seen the shooting of 18-year-old Mike Brown in nearby Ferguson, while Darren Wilson, the officer who shot Brown, was not charged. He also was only one of two African-American members of Sigma Alpha Epsilon’s Washington chapter at the time. That fraternity had received a year’s probation from the college for a race-related pledge incident a year before Claude joined. Claude explained that pledges had been told to repeat a rap song, poetry-slam style, in a public place. One pledge, who was white, recited one in the school dining hall. The song included the “N-word,” and the pledge’s performance was close enough for a large table of African-American students to hear it. Calls were made for that pledge’s expulsion and SAE’s removal from the school. So Claude worked with SAE to restore its image through different philanthropy events he led. Yet, he said, recruiting African-Americans was no easy feat because SAE still had a racist stigma attached to it. Then came another bombshell: a video of SAE’s University of Oklahoma chapter singing a version of “If You’re Happy and You Know It” with racist lyrics — which included the “N-word” — had gone viral. He proposed the Washington SAE chapter hold a forum to figure out how to be part of the solution in the wake of the Oklahoma incident. The pledge who had said the “N-word” in the SAE Washington dining hall rap incident had by now become chapter president, and was one of the strongest allies in helping Claude persuade the rest of SAE to support the programming. Other student groups at Washington banded with SAE and pledged their support — until, one-by-one, each group notified SAE that they were no longer interested. That kind of thinking was why our attorneys first got together to create our Student Diversity Law School Scholarship. 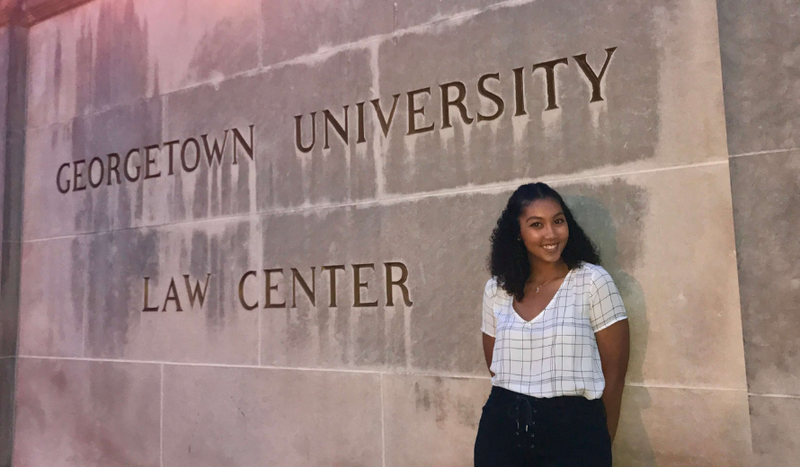 It is also what makes Claude Harrington the perfect recipient for our 2017 Law Student Diversity Scholarship. Our lawyers wish Claude nothing but the best during his studies at Stanford Law School and in his promising, legal career that will follow. Each year, Michigan Auto Law awards a Diversity Scholarship to a law student. The next scholarship deadline is June 1, 2018. For more information on application guidelines and eligibility, visit our Diversity Scholarship webpage. Michigan Auto Law also offers two other scholarships annually. In addition to the Law Student Diversity Scholarship, our attorneys contribute to a scholarship for college students who have been seriously injured in an automobile accident as well as a Distracted Driving Awareness scholarship for high school juniors and seniors. Visit our Scholarship Page to learn more.